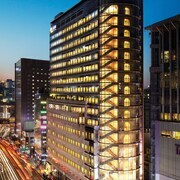 lastminute.co.nz features stacks of homes away from homes in Seoul. Take a break from your work tasks and check out the 934 hotel alternatives, all within a 10-kilometre radius of the city centre. Basing yourself way out in Woop Woop can be a real drag. Luckily for you, lastminute.co.nz offers some awesome hotel deals within a 1-kilometre radius of Seoul's central area, such as the Lotte Hotel Seoul and The Westin Chosun Seoul. Myeongdong rocks if you're in the hunt for an area with heaps of hotels. 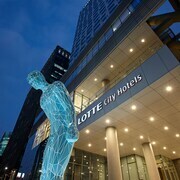 Choose from a number of options, including the Royal Hotel Seoul and The Grand Hotel Myeongdong. Visitors can also find some great places to base themselves in Jongno. This popular area is 3 kilometres from the centre of Seoul. Some of the popular Jongno places to lay your head include the SLA Seoul Loft Apartments and Somerset Palace Seoul. 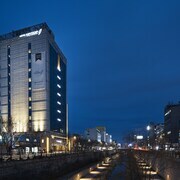 Other areas with a range of hotels include Jung-gu and Dongdaemun. The Banyan Tree Club & Spa Seoul and The Shilla Seoul are in Jung-gu, while Dongdaemun is where you'll find the VIV Classic Hotel and Golden Forest Residence. Namdaemun is 0.8 kilometres from Seoul's downtown, while Itaewon is 4 kilometres from central Seoul. The THE PLAZA Seoul, Autograph Collection and Millennium Seoul Hilton can be found in Namdaemun, while Grand Hyatt Seoul and Imperial Palace Boutique Hotel, Itaewon are in Itaewon. 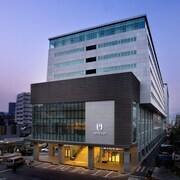 The W Seoul Walkerhill can be found 11 kilometres from the main part of Seoul. Another option is the The Ritz-Carlton, Seoul, which is situated 8 kilometres away. Two more hotel options worth checking out around Seoul are the Grand InterContinental Seoul Parnas and the JW Marriott Hotel Seoul. It's well known that we Aussies are pretty chilled, so consider extending your stay and check out the Modern Design Museum and Trickeye Museum, which you'll find in Hongdae, 5 kilometres to the west of Seoul. 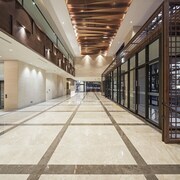 Should you wish to stay in Hongdae, be sure to check out the Grand Hilton Seoul and The Grand Suite. Or, you could stay in Incheon, 35 kilometres to the west of Seoul, where you'll find the Paradise Hotel Incheon and Harbor Park Hotel. If you're staying in Incheon, be sure to explore the Jayu Park and Wolmido Amusement Park. Just because you are on vacation, doesn't mean you can't enjoy your obsession for sports. Seoul World Cup Stadium is situated 8 kilometres to the west of Seoul. 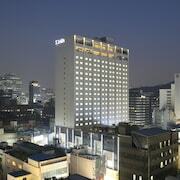 Book accommodation near the action at the Conrad Seoul or the Grand Hilton Seoul. Visitors arriving or departing via Gimpo International Airport may plan to stay at the Lotte City Hotel Gimpo Airport or the Mayfield Hotel & Resort, both of which are a short distance away.